Prime Minister Voreqe Bainimarama yesterday attended the first Pacific Islands Leaders Meeting (PALM) Trade and Investment Promotion Forum along with other leaders. The attention, however, was on Mr Bainimarama and Samoan Prime Minister Tuilaepa Sa’ilele Malielegaoi, who were seated next to each other. No pleasantries were exchanged by the two, yet all eyes were on them. Tuilaepa had recently claimed that all Mr Bainimarama did was play the drums and train and did not have much understanding on matters of international relations. He was reacting to Mr Bainimarama’s call for the removal of New Zealand and Australia from the Pacific Islands Forum as full members and instead to be development partners. Mr Bainimarama retorted that his Samoan counterpart was a lapdog for Australia and New Zealand. 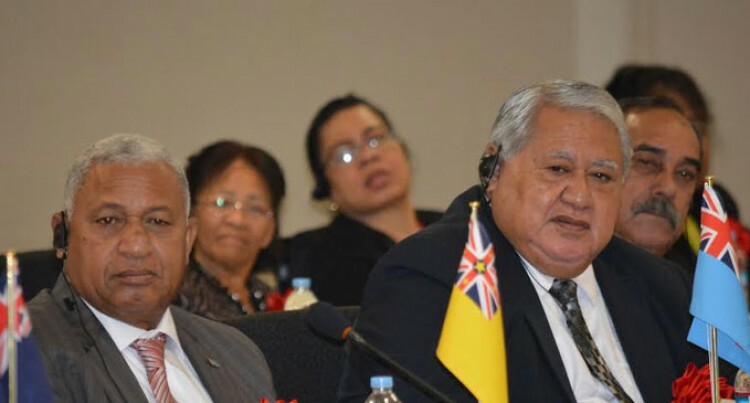 Tuilaepa has wanted Samoa to replace Fiji as the hub of the Pacific Islands and host such regional bodies as the Pacific Islands Forum Secretariat, now based in Suva. During the briefing of international media covering the event, a Japanese Ministry of Foreign Affairs official said they had contacted the Samoan Embassy in Japan to ask whether the two heads of states should be kept apart during the meeting. According to the official, the Samoans said that would not be necessary. It was noticeable that whatever event the Fijian PM attended was not attended by his Samoan counterpart and vice-versa. For instance, after the forum, the leaders attended the Pacific Festa where products of all Pacific island nations were displayed. Mr Bainimarama gave the Festa a miss. Mr Bainimarama instead attended a tea party ceremony with Emperor Akihito and Empress Michiko. At the trade forum a number of Japanese companies such as Hitachi made their presentations to the visiting Heads of States. When this edition went to press, Papua New Guinea PM Peter O’Neill had not met with Mr Bainimarama. Mr Bainimarama confirmed to Fiji Sun that he was not aware of any such meeting despite Mr O’Neill saying he hoped to have one.